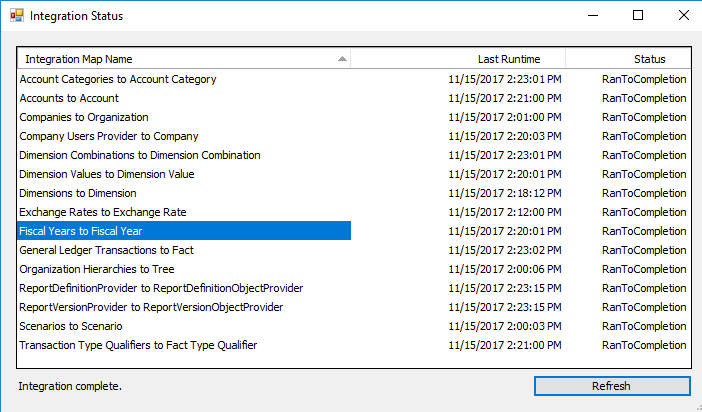 To get Finance and Operations Financial reporting release 7.2.6.0, you can download KB 4052514 from https://fix.lcs.dynamics.com/Issue/Resolved?kb=4052514. The steps in this process are supported for Finance and Operations Financial reporting release 7.2.6.0 and later. If you have an earlier release, contact the Support team for assistance. The Finance and Operations database was restored, but the data mart database wasn't restored. You see incorrect data for a period. Support instructs you to reset the data mart as part of a troubleshooting step. 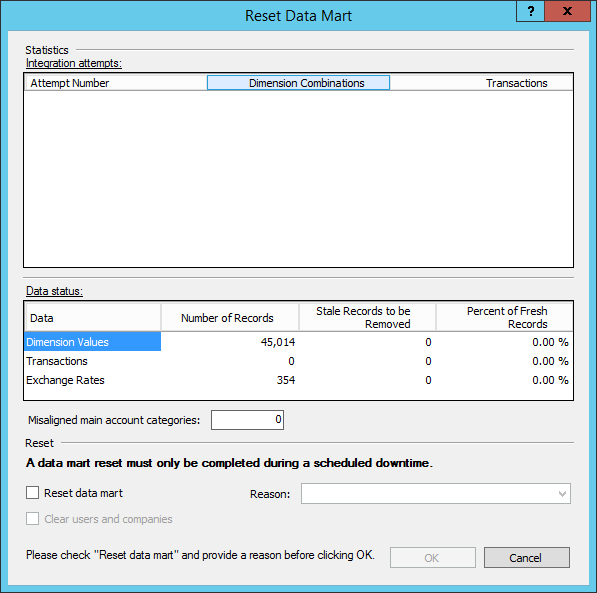 The data mart reset should be done only during times when the amount of processing on the database is small. Financial reporting will be unavailable during the reset process. To reset the data mart, in Report designer, on the Tools menu, select Reset Data Mart. The dialog box that appears has two sections: Statistics and Reset. The Integration attempts grid shows how many times the system has tried to integrate transactions. The system continues to try to integrate data over a period of days if the first few attempts aren't successful. 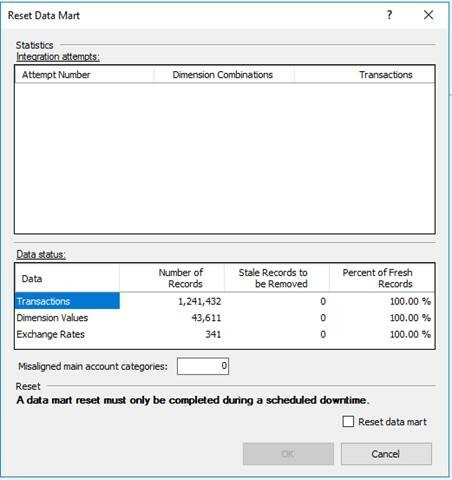 You will know that the data mart must be reset is if the number of attempts is 8 or more, and if there are many Dimension combination or Transaction records. In this situation, the data won't be reported on. The Data status grid provides a snapshot of the transactions, exchange rates, and dimension values in the data mart. A large number of stale records indicates that numerous updates to the records have occurred. This situation might cause slower report generation times. If you're using a release that is earlier than Microsoft Dynamics 365 for Finance and Operations Financial reporting release 7.2.1, you might have to reset the data mart if you rename accounts and move accounts between account categories. These actions can cause main account categories to become misaligned. The Misaligned main account categories field shows whether you're experiencing that issue. To reset the data mart in Finance and Operations Financial reporting release 7.2.6.0 and earlier, in the Reset Data Mart dialog box, select the Reset data mart check box, and then select OK. You should reset the data mart only during scheduled downtime. Missing or incorrect data – Based on the statistics, you've determined that data might be missing. Before you continue, we recommend that you work with Support to determine the root cause. Restore database – The Finance and Operations database was restored, but the database for the Financial reporting data mart wasn't restored. Other – You're resetting the data mart for another reason. If you're concerned that there is an issue, contact Support to identify it. Verify that all data mart reset tasks have completed an initial load before you begin a reset. You can confirm this by looking for a value in the Last Runtime column by selecting Tools > Integration status. Select the Clear users and companies check box if you restored your database, but you then made changes to users or companies. You should rarely have to select this check box. When you're ready to start the reset process, select OK. You're prompted to confirm that you're ready to start the process. Note that Financial reporting won't be available during the reset and the initial data integration that occurs afterward. If you want to review the status of the integration, select Tools > Integration status to see the last time that the integration was run and the status. The reset is finished when all mappings show the status of RanToCompletion and the Integration Status window says "Integration complete" in the bottom-left corner. If you ever restore your Finance and Operations database from a backup or copy the database from another environment, you must follow the steps in this section to help guarantee that the Financial reporting data mart correctly uses the restored Finance and Operations database. The steps in this process are supported for Microsoft Dynamics AX application version 7.0.1 (May 2016) (application build 7.0.1265.23014 and Financial reporting build 7.0.10000.4) and later. If you have an earlier version of Finance and Operations, contact Support for assistance. First, follow these steps to export the report designs from Report designer. In Report designer, select Company > Building Block Groups. Select the building block group to export, and then select Export. For Finance and Operations, only one building block group is supported, Default. To export all your report definitions and the associated building blocks, select Select All. To export specific reports, rows, columns, trees, or dimension sets, select the appropriate tab, and then select the items to export. Press and hold the Ctrl key to select multiple items on a tab. When you select reports to export, the associated rows, columns, trees, and dimension sets are selected. Enter a file name, and select a secure location where you want to save the exported report definitions. You can copy or upload the file to a secure location. In this way, the file can be imported into a different environment later. For information about how to use a Microsoft Azure storage account, see Transfer data with the AzCopy Command-Line Utility. Microsoft doesn't provide a storage account as part of your Finance and Operations agreement. You must either purchase a storage account or use a storage account from a separate Azure subscription. Be aware of the behavior of drive D on Azure virtual machines (VMs). Don't permanently store your exported building block groups on drive D. For more information about temporary drives, see Understanding the temporary drive on Windows Azure Virtual Machines. The following Microsoft Windows services will have open connections to the Finance and Operations database. Therefore, you must use Microsoft Remote Desktop to connect to all the computers in the environment and then use services.msc to stop these services. Download the latest MinorVersionDataUpgrade.zip package. For instructions about how to find and download the correct version of the data upgrade package, see the section Select the correct data upgrade deployable package in the Upgrade data in development, demo, or sandbox environments topic. An upgrade isn't required in order to download the MinorVersionDataUpgrade.zip package. Therefore, you just have follow the steps in the "Download the latest data upgrade deployable package" section of that topic. You can skip all the other steps in the topic. These scripts help guarantee that the users, roles, and change tracking settings are correct. On the AOS computer, start Microsoft Windows PowerShell as an administrator, and run the following commands to reset the integration between Finance and Operations and Financial reporting. SkipMRTableReset preserves tree unit security if you are using it. If you get an error that a parameter cannot be found that matches SkipMRTableReset, you can remove the parameter and try again (later versions have updated the default behavior to include this switch). The valid values for -Reason are SERVICING, BADDATA, and OTHER. The -ReasonDetail parameter is free text. The reason and reason detail will be recorded in telemetry/environment monitoring. After you run the commands, you will be asked to enter Y to confirm that you want to reset the database. Import your report designs from Report designer by using the file that was created during the export. Select the Default building block, and then select Import. Select the file that contains the exported report definitions, and then select Open. To import all the report definitions and the associated building blocks, select Select All. To import specific reports, rows, columns, trees, or dimension sets, select the reports, rows, columns, trees, or dimension sets to import. Instruct all users to exit Report designer and the Financial reporting area of Finance and Operations. Run the following script against the Financial reporting database (MRDB). Truncate or delete all records from the FINANCIALREPORTS table in the Finance and Operations database (AXDB). Truncate or delete all records from the FINANCIALREPORTVERSION table, if this table exists in the Finance and Operations database. If the table doesn't exist in the Finance and Operations database, skip this step. Run the ResetDatamart.sql script against the Financial reporting database. This script disables the data mart integration, deletes all the data mart data, and then reenables the data mart integration. After the reset, you can manually verify the data reload by running the following query against the Financial reporting database. Confirm that all rows have a LastRunTime value, and that StateType is set to 5. A StateType value of 5 indicates that the data was successfully reloaded. A value of 7 indicates a faulted state. Sometimes, the Organization Hierarchy map has this state the first time that it runs. However, the faulted state but should be automatically resolved.